Archbishop Desmond Tutu wants euthanasia? South Africa’s Archbishop Desmond Tutu has said in a birthday message in the Washington Post that he wants the option of assisted death. “I have prepared for my death and have made it clear that I do not wish to be kept alive at all costs. I hope I am treated with compassion and allowed to pass on to the next phase of life’s journey in the manner of my choice. Dying people should have the right to choose how and when they leave Mother Earth. I believe that, alongside the wonderful palliative care that exists, their choices should include a dignified assisted death.” Quoting Washington Post, Africa Review said, he announced the reversal of his lifelong opposition to assisted dying in 2014. The archibishop’s announcement come as no surprise in South Africa. The issue of euthanasia or assisted death has divided the nation for a period of time. Last year the High Court in the capital Pretoria ruled in favour of terminally ill cancer patient Robin Strasham-Ford who had applied for assisted death. He had only two weeks left and wanted the law to be amended so that he would have assisted death without the prospect of prosecution. The law used to be very clear – any doctors who help patients die could face prison time of up to 14 years. The country has no legislation for euthanasia, while the constitution protects the right to life. 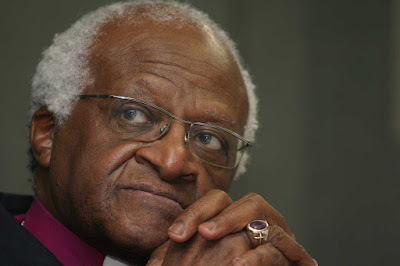 On 7th of Sept, 1986, Desmond Tutu becomes the first black leader of the Anglican church of South Africa He marks his 85th birthday on Friday, October 7.